Spring has sprung, and love is in the air. Most of us have that special pet in our lives, but some of us are lucky enough to have a special someone else in our lives. Perhaps you both got your pet together, and now you are ready to take that next step with regards to your future. Don’t let your pet miss out on being a part of your forever and ever. Proposal image referenced from Huffingtonpost.com, and can be found here. There are honestly so many ideas that you could come up with to include your pet with your proposal. Get creative and jot some ideas down, and see what works best for you. A few suggestions would be to get a name tag engraved with “Will You Marry Me” or, teach your pet to balance a ring on their head. The fact of the matter is, you know your pet best. Have fun with it, and them! Engagement photo referenced from theknot.com, and can be found here. 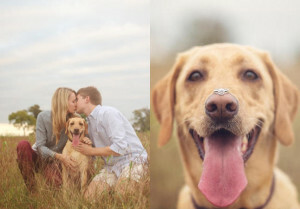 I love the idea of pets being in engagement photo’s, just remember that pets can be unpredictable. In the event that you hire a photographer, be sure to give them a heads up so that they are also prepared. It probably wouldn’t hurt to bring some extra treats with you the day of the photoshoot. 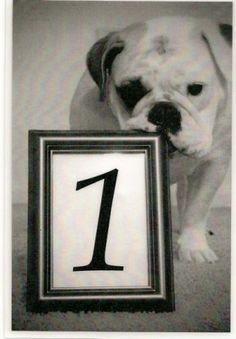 Invitations are another great way to include your pet. Sites such as Shutterfly make creating your own invitations and save the dates a breeze! Wedding image referenced from Huffingtonpost.com, and can be found here. There is nothing like man’s best friend being the best man, flower girl, ring bearer, or maid of honor! Your pet can have any role at your wedding. Be sure to check with the venue that they are pet friendly. If you plan on including your pet, do your homework and check out sites such as BringFido.com for a list of pet friendly attractions. Receptions can become pretty hectic, and maybe even scary for some pets. Do not assume that your drunk uncle is keeping an eye out on your pet, hire a pet sitter! Image referenced from Topweddingsites.com, and can be found here. The ceremony is over, and now your pet sitter is keeping an eye on your furbaby. Time to get the party started! Do not feel bad if your pet can’t be a physical part of the festivities. Have your guests find their seat at a table marked with your pets picture! There are a lot of cute ways you can include your pet in your decor, such as name place cards, centerpieces, cake toppers, table favors, and so much more! We understand that some pets may have crossed over the rainbow bridge, but they are forever in your hearts. Include your beloved pet with a beautiful pet memorial, guest book, or let your guests know that money from the dollar dance will be donated to your favorite rescue in memory of your pet. It’s your day, make it special. 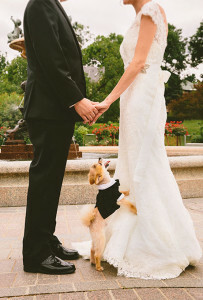 Have you included your pet in your wedding? Please share how in the comments below! We would love to see pictures too. Please feel free to post your pictures to our Facebook page! I love these pictures, I would love to include my dog in my wedding as well. Such cute ideas, thanks for the post. You’re very welcome Sheila! There are a ton of cute ideas out there! 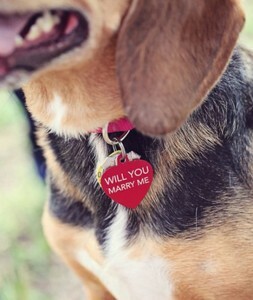 Its really a great idea for Pet in Wedding Planning. I love those pic specially Ceremony sure i will try this. Interesting article bookmarked. I love these images . I will take my pug at my friend weddings. this is really a great idea.